We again wake up to a brilliant full moon peeking over the hills, casting a bright liquid path on the Mosel River. A barge throbs as it passes through the light. Docking at the town of Zell near 6 AM, we look out on tall half-timbered houses across the river, dark hills rising behind them. Lights appear in the windows of some of the houses, early risers getting off to work. Vineyard tractors and trailers are busy in the clear, crisp morning. On a short stroll through town we come upon the statue of a large black cat, the symbol for Swartzse Katz Wine, famous in the area. By 8:30 we’re on a bus following the banks of the Mosel River and are on our way to Luxembourg. Scarves of fog lie like banners on the river and across some of the lower vineyards. Nearby, some of the trees are beginning to show their fall colors. Workers are out early in the steep vineyards, harvesting clusters of grapes. Leaving the river’s edge, the bus climbs the hills to a point high enough that we can look down on the river, just visible through the trees. Once out of the woods we cruise through open country where farmers grow tobacco, corn, wheat and Christmas trees. White cows graze in a green field. The bus suddenly plunges into a valley of mist, another morning fog bank. Out of the mist into sunlight again, we cross into Luxembourg. Our bus passes under a wide bridge that is actually part of the runway of the Luxembourg Airport. 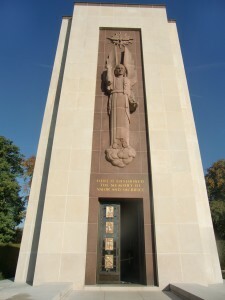 Shortly, we reach our first destination of the day, the Luxembourg American Cemetery and Memorial. We feel fortunate that it is open as it had been closed for a number of days when congress was not funding the government. Although the cemetery is impressive with its even rows of crosses and Stars of David, it is considerably smaller than the American Cemetery in Normandy. The pure white headstones, 5,076 of them, contrast beautifully with the deep green of the carefully manicured grass. Forests surrounding the cemetery give it a natural feel. 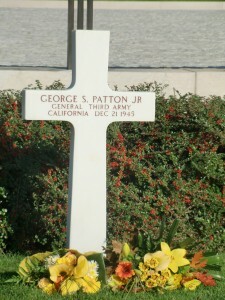 The most noted grave, one that stands alone from the rest, is that of General George S. Patton, Jr., esteemed by all the people of Luxembourg because of his liberation of the area. A tall chapel stands alone. A stone wall upon which the battles fought in Luxembourg, including the Battle of the Bulge, are clearly depicted, rises near the entrance. The Germans invaded Luxembourg in 1940 and it was under German control until liberated by the Allies in late 1944 and early 1945. The country was annexed by Germany in 1842. The Nazis began a period of Germanization, making German the official language. All males of draft age were inducted into the German Army. In December of 1944 the Germans launched a surprise offensive through the Ardennes with Antwerp as its objective. The maneuver cut off the American troops, in fact, surrounded them near Bastogne, resulting in the Battle of the Bulge, one of the fiercest battles of the war. Most of the crosses we see before us represent those that perished in this battle. As we stroll these hallowed grounds, the roars of planes taking off from the nearby airfield are a common sound. I would have liked to have had more time here to stand among the graves and reflect. As I was also a veteran of World War II, flying bombing missions in Europe, I feel a kinship to those who fell, some of them from bombing groups close to my airfield in England. I feel fortunate that one of the headstones was not mine,that I am alive today to see this memorial. We move on several miles to Sandweiler, the German Military Cemetery. Walking along paths shaded by the spreading trees of a beech forest, we come upon the cemetery. The crosses here are darker and rather stubby but are also arranged in rows. On each cross are the names of the four men buried beneath it, two on the front and two on the back. Trees planted among the graves break up the symmetry of the rows and allow shade to touch some of the graves. 10,913 German soldiers are buried at Sandweiler, 4,829 of them in one single common grave, Many of the soldiers buried here were old men and youths of 16 and 17 years of age, an indication of the plight of the German army at that point in the war. Like the Americans buried in the Luxembourg Cemetery, the men buried in Sandweiler also were killed in the Battle of the Bulge. It had been a grim morning, but having paid our respects to the fallen soldiers, we are now on our now way to the city of Luxembourg where we will walk among the living and enjoy the spirit of the city. The chapel at the cemetery stands tall. The grave of General George S. Patton Jr. is separated from the rest as he is considered a hero by the people of Luxembourg as he liberated the area. 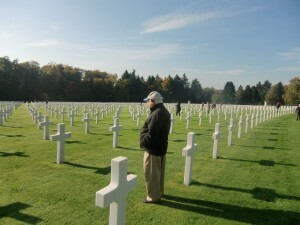 The author, Charles "Norm" Stevens, stands among the crosses at the Luxembourg American Cemetery. 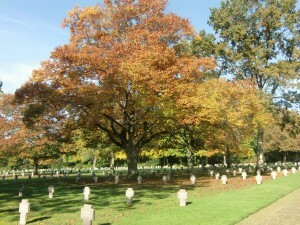 Only a few miles from the American Cemetery is the Sandweiler Cemetery where over 10,000 German soldiers are buried. Charles “Norm” Stevens, a 40 year resident of Monterey Park and World War II Veteran has recently published the 3rd in his series about his experiences in WW II, Back from Combat: A WWII Bombardier Faces His Military Future. This book details the time from when he returned from combat in England where he flew 34 missions over Germany and France until the end of the war. Faced with large numbers of returning combat vets, and not knowing how long the war would continue, the military had to plan for their future. His options were whether to return to combat, become an instructor in the U.S., or receive new training that he would use in the Pacific. The book concludes with the end of the war with an Afterward that includes an update on the B-l7’s still flying in the U.S., as well as present day accounts pertaining to the war. He is known to the readers of The Citizen’s Voice as the author of Travel Log Articles including “From Paris to Normandy on the Seine”, “Exploring New York” and “In Search of Snow.” He is retired, having taught for 32 years, primarily in the Montebello Unified School District.